Native Instruments has announced that its long-awaited Kore 2 "Super Instrument" is now shipping. Comprising a hardware interface and a heavily revised software application, this is the successor to the original Kore that debuted in 2006. Unlike Kore 1 - which was essentially a host system - Kore 2 is capable of producing a wide range of different sounds. In fact, it features the audio engines from six of NI's most popular products: Reaktor, Massive, Absynth, FM8, Kontakt and Guitar Rig. A main library of 500 presets is included, though because each sound comes with eight variations, you actually have immediate access to 4000 sounds. 400 FX KoreSounds are supplied too. To aid preset selection, NI has developed a new and improved KoreSound Browser. This enables you to choose your instrument by selecting musical characteristics or by using the text search option. Unlike the original Kore controller, the new hardware doesn't have any audio interfacing functionality. However, the eight touch-sensitive, high-resolution knobs have been revised and optimised, and we're assured that the controller now integrates better with the software. Kore 2 is available now for Mac and PC priced at $559/€499/£350. 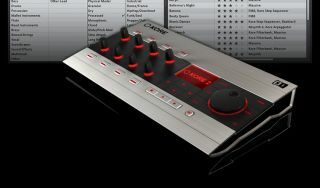 It's capable of hosting VST and Audio Units plug-ins and running standalone or as a VST, Audio Units or RTAS plug-in. Check out the Kore 2 product page on the Native Instruments website for more.